More power per channel for the Heatmaster 2! To allow connection of even more powerful pumps or more fans to one channel, this cooler was developed to allow integration into the water cooling loop. This increases the output power of an individual channel from 18W to 38W. This allows maximum utilization of the potential of the channels. Important: The total power draw from all channels must not exceed 75W. The increased cooling performance and easy installation with the included 1mm thick thermal pad and mounting material help lift the Heatmaster2 to a new performance level. 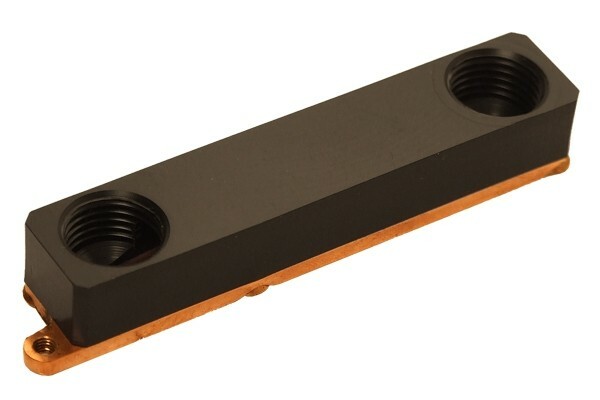 With a copper cooling plate and Acetal top plate both cooling performance and looks are perfect! The G1/4” connection threads allow maximum fitting compatibility and make for quick integration into any cooling loop. Please send us a request via mail to info@aquatuning.de , because we can not send pictures with this messages.